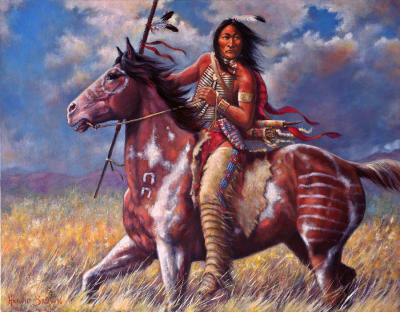 The great Lakota Indian warrior, Chief Sitting Bull, is perhaps best known in early American history as the chief who defeated General Custer in 1876 at the Battle of Little Bighorn. THE BATTLE OF LITTLE BIGHORN, 1876 — Sioux, Cheyenne, Arapaho and other tribes set aside their differences in the face of intolerable abuse by the U.S. Government, and their warriors were amassing in the thousands when General George Custer ordered his 700 soldiers of the 7th Cavalry of the United States Army to attack the Indian war party and his 700-troop regiment was subsequently annihilated in the ensuing battle. History books describe Custer as a headstrong, impulsive professional soldier who developed his reputation as an "Indian fighter" for leading bloody campaigns against the Kiowas and the Cheyennes on the southern plains — but history records that some of General Custer's superiors and subordinates felt he lacked the judgement needed to defeat a savvy, tough Indian warrior like CHIEF SITTING BULL on the battlefield. By some historical accounts, Custer was aspiring to run for the office of president of the United States and saw this fight as an opportunity to seize more battle-field notoriety to enhance his military reputation and presidential aspirations. Custer is said to have disobeyed direct orders to holdup and meet with supporting troops to coordinate an attack — instead, in what is believed to have been an attempt to be credited with winning the battle — Custer pushed his men and horses to travel at a fast pace through two days and nights to beat supporting army regiments to the area, and then Custer's men attacked the superior Indigenous forces on bad intelligence. The Indian police rousted the naked chief from his bed at 6:00 in the morning, hoping to spirit him away before his guards and neighbors knew what had happened. When the fifty-nine-year-old chief refused to go quietly, a crowd gathered, and a few hotheaded young men threatened the Indian police. 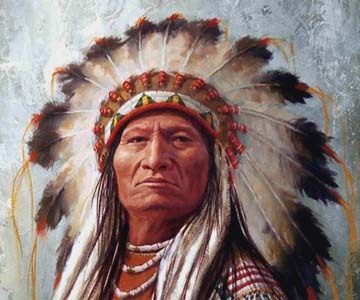 Someone fired a shot that hit one of the Indian police; they retaliated by shooting Sitting Bull in the chest and head. 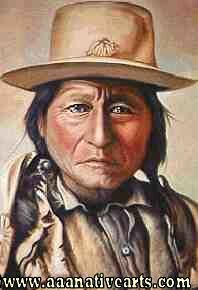 The great chief was killed instantly. Before the ensuing gunfight ended, twelve other Indians were dead, and three were wounded.